For a long time I was taking a one-size-fits-all style vitamin supplement. It wasn't until about a year ago that I realized my body was in change mode as it approached its mid 30's mark and it was crying out for help.... so now I am listening. It's time to get specific with my needs for optimal health. 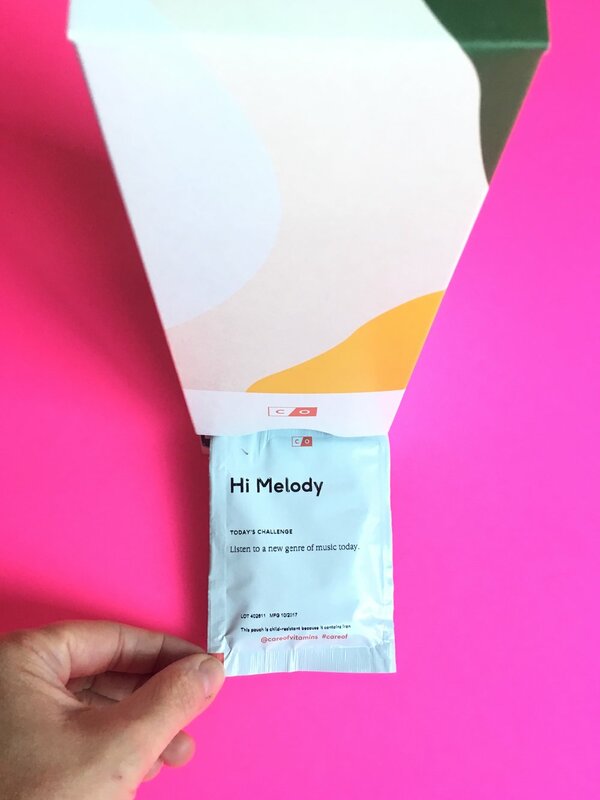 I recently heard a friend share her experience with care/of personalized vitamin subscription. care/of is built on the foundation of transparency, quality and honesty. Just read about their awesomeness HERE! This is everything I expect from a company supplying me with what I need to improve my health and wellness. I trust that they have my back! I started by taking the fun little SURVEY where they got to know the basics of who I am, my lifestyle, values, and what's important to me as far as my health goes. Once my survey was complete, care/of suggested a personalized pack of vitamins specific to my needs. Each vitamin listed in my pack was accompanied by a description, list of benefits, sourcing information, ingredients, and supporting research statistics. I really enjoyed immersing myself in the knowledge of these vitamins. I felt informed and confident. A personalized pack will ship each month with your subscription! The convenience of the individual daily packs within the cute dispenser (remember, I'm a sucker for packaging!) makes life so much easier when it comes to taking my vitamins! No filling pill boxes, opening a million bottles each morning, or making special trips to the store when I run out. If you are custom to taking your vitamins at work when you eat breakfast, the packs make it convenient to stash a handful in your desk drawer at the office. care/of truly makes it simple! You can choose to adjust your pack as you see fit - add, remove, change. You do not need to commit to what care/of recommends for you. In my case, I'm completely satisfied with what they recommended. I'm 3 weeks in to my supply and so far I have been feeling GREAT! The fatigue I had been fighting has been diminishing and overall I feel healthier during this cold/flu season! Living in the doom and gloom of fall/winter in the PNW requires some Vitamin D like STAT! Combo'd with some blood booster in the Iron capsule, I'm finally feeling lifelike again. My new love is Ashwagandha - aka "the chill pill" - which helps with some major pet peeves of mine... Food & Stress! Ya feel? I believe each of us are unique and that means how we supplement our body's needs should also be unique. One pill doesn't take care of EVERYONE. If you are curious about care/of, you can get your first month's subscription for HALF OFF by using code HONEST50 at check out. Visit www.takecareof.com to take care of YOU! Questions or need some help? Their customer service team is kind and caring. They must be taking their vitamins! *Disclaimer: It is my hope that you found my honest review of CARE/OF helpful! CARE/OF kindly provided product in exchange for my honest opinion. I was not financially compensated for this post. The opinions expressed here are completely my own based on my experience.